Veteran Chelsea midfielder Claude Makelele has signed a new one-year contract extension. The 34-year-old's current deal had been set to expire at the end of the current season and he would have been able to negotiate a move away from January. 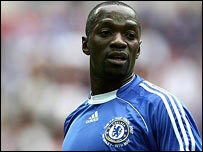 However, the Zaire-born Frenchman has extended his stay in West London until 2009, when he will be 36. Former Chelsea boss Claudio Ranieri spent £13.9m to sign the player from Real Madrid in 2003. The combative holding midfielder won the French league with Nantes and the Spanish La Liga title and the Champions League with Madrid. He also had spells at Marseille (1997-98) and Celta Vigo (1998-2000). And since arriving at Stamford Bridge he has been an integral member of Chelsea's success. He helped Jose Mourinho's side win the Premier League English title in 2005 and 2006, as well as two Carling Cup triumphs and the FA Cup last May. Despite having retired from international football, he agreed to return for France as they struggled to qualify for last year's World Cup before going on to reach the final of the tournament, only to lose to Italy in July 2006. Meanwhile, 18-year-old defender Sam Hutchinson has signed a new four-year contract at Stamford Bridge, following Scott Sinclair's commitment to a long-term deal last week.